The Obama Administration has publicly expressed confidence about the safety of Pakistan’s nuclear arsenal. But in private, Western officials say this is a top concern as the Taliban carried out major attacks in Karachi this week. Less than 48 hours after attacking Karachi’s international airport on Sunday, the Taliban claimed responsibility for the attack on an airport training facility in the city on Tuesday. However, State Department spokesman Marie Harf said the Pakistani government was committed to safeguarding its nuclear arsenal. “We believe the Pakistani government understands the importance of protecting all of its arsenal, including things related to its nuclear programme. We know that they care about this a great deal and have no reason at this point to think it’s anything but safe,” Harf said. Pakistan has, with the US help, put in place a robust set of measures to secure its nuclear weapons. Pakistan’s military is believed to have a 10,000-person force specifically designated to protecting nuclear facilities. Pakistani fears that its nuclear arsenal could be in jeopardy in the event of a conflict with India prompted it to locate most of these facilities in the north and west of the country and around the capital Islamabad. The coming weekend — June 14 and June 15 — will be used by the new ruling regime to focus on military issues. Prime Minister Narendra Modi is expected to spend more than three hours on board the sea-borne aircraft carrier, the INS Vikramaditya while Defence Minister Arun Jaitley is slated to visit Srinagar where he is to be briefed by the Indian Army on various issues. 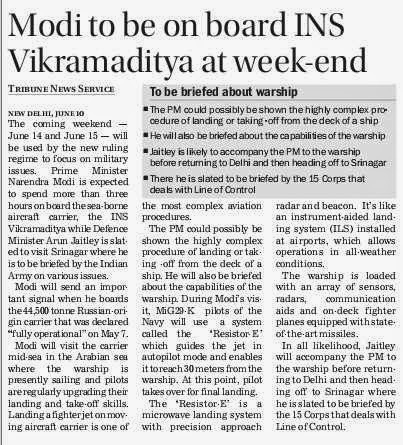 Modi will send an important signal when he boards the 44,500 tonne Russian-origin carrier that was declared “fully operational” on May 7. Modi will visit the carrier mid-sea in the Arabian sea where the warship is presently sailing and pilots are regularly upgrading their landing and take-off skills. Landing a fighter jet on moving aircraft carrier is one of the most complex aviation procedures. The PM could possibly be shown the highly complex procedure of landing or taking -off from the deck of a ship. He will also be briefed about the capabilities of the warship. During Modi’s visit, MiG29-K pilots of the Navy will use a system called the ‘Resistor-E’ which guides the jet in autopilot mode and enables it to reach 30 meters from the warship. At this point, pilot takes over for final landing. The ‘Resistor-E’ is a microwave landing system with precision approach radar and beacon. It’s like an instrument-aided landing system (ILS) installed at airports, which allows operations in all-weather conditions. The warship is loaded with an array of sensors, radars, communication aids and on-deck fighter planes equipped with state-of-the-art missiles. In all likelihood, Jaitley will accompany the PM to the warship before returning to Delhi and then heading off to Srinagar where he is slated to be briefed by the 15 Corps that deals with Line of Control. The bitter succession battle that rocked the Army in the past three years has taken a new turn with the Congress demanding resignation of former Army Chief General VK Singh (retd) as minister in the BJP-led NDA government. The Congress took the stand after the Ministry of Defence in an affidavit told the Supreme Court yesterday that the disciplinary and vigilance (DV) ban imposed on Lt Gen Dalbir Singh Suhag in May 2012 by Gen VK Singh in his then capacity as Army Chief, was premeditated and in disrespect of legal procedures. Lt Gen Suhag was been appointed Army Chief last month and is set to succeed General Bikram Singh on July 31. Gen VK Singh, a BJP MP from Ghaziabad, is MoS Development of North Eastern Region (independent charge), External Affairs and Overseas Indian Affairs. The DV ban was imposed on May 19, 2012, less than two weeks before VK Singh’s tenure ended on May 31, 2012, stalling Lt Gen Suhag’s selection as the Eastern Army Commander. It had left the MoD stinging as the DV ban had been imposed without even waiting for Lt Gen Suhag’s reply to the show cause notice that had been served on him while he was in Delhi attending to his ailing mother. After the government has stated in a sworn affidavit to the apex court that VK Singh as Army Chief had acted on motivation in imposing a vigilance and disciplinary ban on the then Lt Gen DS Suhag, it becomes morally, ethically incorrect to have him in the Council of Ministers. 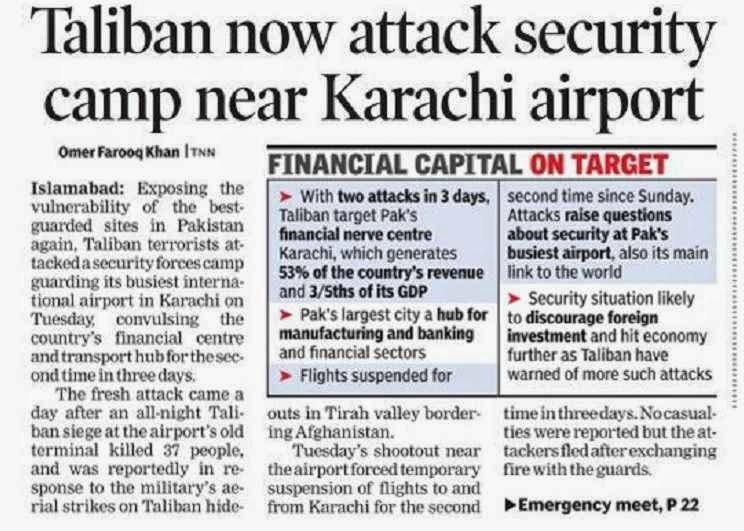 Karachi airport became the latest causality of the continuing war by terrorists as it was attacked twice in two days. In a shocking assault on a major airport in Pakistan, 10 terrorists infiltrated Jinnah International Airport on Sunday. They used rockets, grenades and automatic weapons as they wreaked havoc and killed a number of civilians before they were shot down by the military. Security forces too suffered losses, especially those of the Airport Security Force (ASF); 11 of them were killed in action. Naturally the international airport was shut down and operations came to a halt. The terrorist umbrella organisation Tehreek-e-Taliban (TTP) later claimed responsibility for the attack in which 10 of its militants were killed. The terrorist attack drew international condemnation, including that from India. Ironically, the Pakistan government has been in talks with the TTP. Terrorists have again shown that anyone who tries to have any truck with them does so at his own peril. How can the fact that the TTP has been behind major terrorist attacks be ignored? The peace talks were naturally aborted, even as the air force launched attacks on suspected Taliban strongholds in the Federally Administered Tribal Areas. The terrorists retorted with another attack on the airport on Tuesday, this time on the ASF camp. Again the TTP claimed responsibility. The second attack seems to have been contained, but it has damaged Pakistan's credibility in maintaining the safety of its vital installations. It also shows the capability of the terrorists to strike deep in Pakistani territory at will, and their ability to infiltrate high-security areas. Even as Pakistani security agencies battle terrorists, it is the long-suffering people of the country who have to generate sufficient pressure on the establishment to make it realise that terror is taking too heavy a toll. The government and the military establishment of Pakistan must finally abandon any notions of negotiating with terrorists and now act in concert to confront terror. The Karachi attacks could then be the beginning of a process that will allow its citizens to live peacefully. Singh is a Minister of State with Development of North Eastern Region (independent charge), External Affairs and Overseas Indian Affairs as his portfolios. Taking charge last month, Jaitley had said that there was no objection of the BJP on the officer stated to be the chief. He said that the only objection had been on the propriety of rushing through with the appointment but this was, in no way, meant to reflect on the person (Dalbir Singh) under consideration. 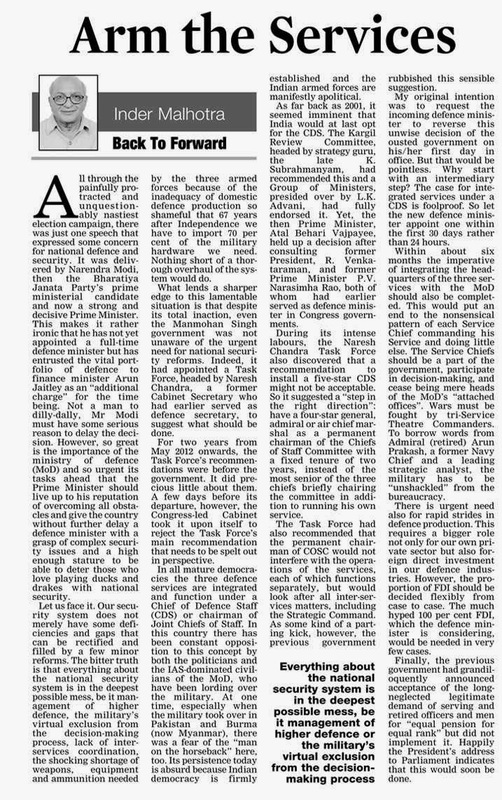 Singh’s attack came even as the Congress demanded his resignation arguing that the NDA Government’s affidavit in the Supreme Court on the issue of Army vice chief Dalbir Singh Suhag’s promotion as Army commander was a “direct vote of no confidence” against him. In its affidavit to the Supreme Court on Monday, the Ministry of Defence had defended Suhag’s promotion and described the disciplinary ban on him by Singh as Army chief as “illegal”, “extraneous” and “premeditated”. It also said the the disciplinary proceedings against Suhag between April and May 2012 by Singh was “without any basis or material on record”. When told about Singh’s remarks against the Army chief designate, Government spokesman and I&B Minister Prakash Javadekar declined to comment. The Congress stepped up its attack. “After this vote of no confidence by the Government in a solemnly sworn affidavit against its own member of its council of ministers, is it possible for the minister in the union council of continue…I don’t think in any view of the matter that the member of the council of ministers can continue. It is a matter of detail whether he is removed or resigns,” Congress spokesperson Abhishek Singhvi said. Defence Ministry officials said that the affidavit was based on the considered legal opinion on the matter that had been presented to the AFT (armed forces tribunal) in the past and that the government cannot change its views on legal matters while going to a higher court. They, however, declined to comment on what V K Singh tweeted today. The government affidavit came in response to a petition by Lt Gen Ravi Dastane, who alleged favouritism in selection of Suhag as Army commander — making him next in line to succeed General Bikram Singh. In his last days in office in May 2012, V K Singh had effectively tried to block the appointment of Suhag as the Eastern Army Commander that would have put him out of contention for the top post. A show-cause notice was issued by V K Singh alleging that Lt Gen Dalbir Singh, then 3 Corps Commander, had not taken action against an intelligence unit that allegedly conducted an illegal raid in Jorhat in December 2011 in which items were reportedly stolen from the house of a contractor. The notice was withdrawn in a few days after V K Singh retired. Since then, it has turned out that Dalbir Singh was on leave when the said incident occurred and that action was taken against a soldier for stealing, among other things, a mobile phone. The soldier has since been dismissed from service and several officers were punished. KATHMANDU: Chief of the Army Staff (CoAS) Gaurav Shumsher Rana on Tuesday left for a weeklong visit to India. Upon the invitation of Chief of Army Staff of Indian Army General Bikram Singh, Rana departed for the southern neighbour with a three-member delegation. Lieutenant General Pawan Bahadur Pande saw off Rana at the Tribhuvan International Airport (TIA) this afternoon. The Army Chief is scheduled to attend the passing out parade of the Indian Military Academy as the Chief Reviewing Officer on June 14. He will also hold meetings with chiefs of Indian Army, Indian Navy and Indian Airforce as well as newly appointed Minister of Defence Arun Jaitley. Rana will also visit the National Defence College and Research and Referral Hospital, New Delhi. This is Rana's third official visit to India since he assumed his office in September 2012. Lieutenant General Pande will function as the acting CoAS in absence of Rana. Rana is slated to return home on June 17. In a twist to the legal battle involving the Army top brass, the government on Monday defended Army vice chief Dalbir Singh Suhag’s promotion as Army commander — entitling him to be the next Army chief — and described the disciplinary ban on him by then Army chief and now Minister of State Gen (retd) V K Singh as “illegal”, “extraneous” and “premeditated”. In the Modi government, V K Singh is a Minister of State with Development of North Eastern Region (independent charge), External Affairs, Overseas Indian Affairs as his portfolios. The UPA II government had approved Lt Gen Dalbir Singh Suhag as the chief-designate — incumbent General Bikram Singh retires on July 31. The convention has been to name a successor two months in advance. Responding to a petition by Lt Gen Ravi Dastane, who alleged favouritism in selection of Dalbir Singh Suhag as Army commander — making him next in line to succeed General Bikram Singh — the Ministry of Defence, in its affidavit to the Supreme Court, said that the disciplinary proceedings against Suhag between April and May 2012 by then chief V K Singh was “without any basis or material on record”. Suhag was placed under a Disciplinary and Vigilance (DV) ban by V K Singh for alleged “failure of command and control” in an operation carried out by an intelligence unit working directly under Suhag, the then Dimapur-based 3 Corps commander. But Suhag’s promotion as Army commander was cleared by Gen Bikram Singh a fortnight after V K Singh retired, by reversing the ban. This delayed promotion, after reserving the vacant Army commander’s post for 15 days, was challenged by Dastane in the Supreme Court. He contended he was eligible to be Army commander but was denied the opportunity by General Bikram Singh who favoured Suhag despite the latter being placed under a ban at the relevant time. The affidavit filed by the Ministry of Defence on Monday not only nixed Dastane’s challenge but also censured the manner in which V K Singh placed Suhag under the ban. and issue of show cause notice were found to be illegal,” the Ministry said, adding Suhag was appointed “in acting rank” (from the date he became eligible) as a matter of policy and not to favour him. Relying on the findings of the competent authority, the Ministry stated that Dastane could not stake any claim to the top post once the DV ban on Suhag was held to be illegal. It added that closure of the case against Suhag could also not said to be hurriedly done and it was “most unwarranted” that an Army Lt General was making unfounded allegations of favouritism. Countering Dastane’s challenge to the selection process, the affidavit said the COAS and the Ministry played the selection board and independently examined the case of as many as seven officers, including Dastane, for consideration as appointment to Army commander. It was only after scrutiny that Suhag and Lt Gen Sanjiv Chachra (who has since retired) were recommended for appointment. It claimed there was nothing wrong in keeping the appointment on hold for some days as the Ministry awaited details of the DV ban on Suhag. On June 6, 2012 the Ministry was informed about the closure of the case. “Once the imposition of the DV ban itself was found to be illegal, then the same would be non est ab initio (nullity from the inception) and it cannot in any manner come in the way of either the consideration or appointment of Suhag,” the Ministry said. The Supreme Court will next hear the matter in September. New Delhi: After the Defence ministry termed as "illegal" his decision to put a ban on promotion of Army Chief designate Dalbir Suhag, Gen (retd)V K Singh, now a Union Minister, on Tuesday justified his action. "If unit kills innocents, does dacoity and then head of organization tries to protect them, should he not be blamed? Criminals should go free! !," he tweeted. The Defence ministry has told the Supreme Court in a recent affidavit in a promotion case related to Lt Gen Ravi Dastane that the alleged lapses which were made as grounds to impose disciplinary ban on Suhag were "premeditated", "vague" and "illegal". The former Army Chief's comments came against the backdrop of reports that a unit under Lt General Dalbir Suhag had allegedly carried out killings and daocities in the North East region. Latching on to the affidavit, Congress spokesperson Abishek Singhvi sought the resignation of V K Singh, saying that the NDA government's affidavit in the Supreme Court on the issue of Army vice chief Dalbir Singh Suhag's promotion was an expression of "no confidence" in him. Singh had a running battle with the UPA II government over a controversy on his date of birth. Incidentally, he is the first minister whose resignation is sought by the Opposition since the BJP government was formed a fortnight ago. 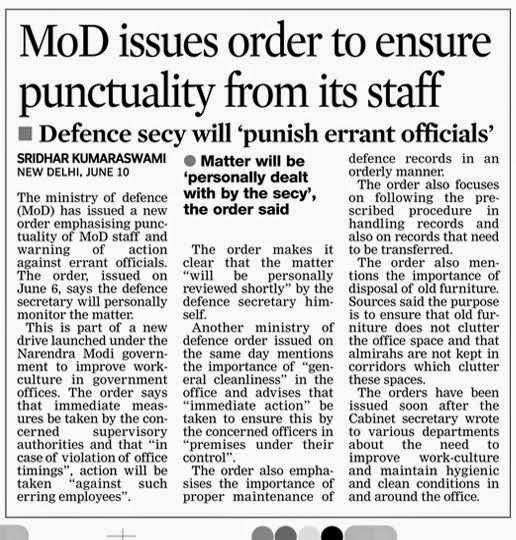 The Defence Ministry, meanwhile, said it has adhered to its stand taken earlier on the issue related to imposition of Discipline and Vigilance(DV) ban on Suhag by Gen Singh. In his other tweet, V K Singh asked," MOD affidavit same as it gave to AFT(Armed Forces Tribunal) under protective and conniving UPA, so what is new folks?" In yet another tweet, he attacked Singhvi saying, "All who got carried away by Singhvi's tirade. "Chhaj to bole so bole who chhalni kya bole jismen1800 chhed" (pot calling the kettle black)." Singh, who is a now Minister of State for Development of North Eastern Region, External Affairs and Overseas Indian Affairs, had placed Suhag under a DV ban for an alleged botched up military intelligence operation by a unit under him. NEW DELHI: Big guns continue to fail to boom in India. The Army is still nowhere near getting the crucial ultra-light howitzers needed to strengthen its new divisions being raised along the 4,057-km Line of Actual Control with China. The long-pending procurement of 145 M-777 ultra-light howitzers in a direct government-to-government deal with the US under its Foreign Military Sales (FMS) has been hit by "huge problems" in the offsets negotiations, say sources. These all-weather howitzers, which are partly made of titanium and can swiftly be airlifted to forward areas by helicopters and aircraft, are primarily meant for high-altitude areas of Arunachal Pradesh and Ladakh. The Army has been demanding such 155mm/39-calibre howitzers, with laser inertial artillery pointing systems and almost 30-km range, to equip the artillery units under the new XVII Mountain Strike Corps (90,000 troops) being raised to get "quick reaction force capabilities" against China. The M-777 deal, as it is, has witnessed a huge cost escalation from the initial $647 million to $885 million due to delays in decision-making by India. "But it's now stuck because the howitzer manufacturer, BAE Systems, could not present a viable offsets package despite several rounds of negotiations," said a defence ministry source. "The defence minister-led Defence Acquisitions Council (DAC) rejected the offsets offer because it was not compliant with guidelines of the 2013 Defence Procurement Policy. Now, the Army has to re-examine and re-field the case for DAC," he added. As per the policy, any foreign arms firm bagging an arms deal over Rs 300 crore had to plough back at least 30% of the contract value back into India as offsets. Though the M-777 howitzers are to be bought from the US, BAE will have to ink the offsets contract with the Indian MoD. The Army's hunt for the ultra-light howitzers had begun almost a decade ago with the hope that it would finally exorcise the Bofors ghost haunting its artillery modernization programme. The force has failed to induct even one modern 155mm artillery gun since the infamous Swedish Bofors scandal exploded in the mid-1980s, followed in later years by the ones involving South African Denel and Singapore Technology Kinetic's (STK). The Pegasus gun of STK, in fact, was the frontrunner in the earlier quest for ultra-light howitzers launched in 2006 after DAC approval. But the firm was blacklisted due to the corruption scandal against former Ordnance Factory Board chairman Sudipto Ghosh. Then, the American FMS route option, which precludes an open competition through a global tender, for the M-777 howitzers was chosen as an alternative for the desperately-needed guns. But the deal is yet to materialize, much like the other projects stuck in the Army's overall Rs 30,000 crore artillery modernization plan. Union Finance Minister Arun Jaitley is facing calls from the three service chiefs to increase the defence budget to close to two per cent of the Gross Domestic Product (GDP), highly placed government sources have told The Hindu. The calls come even as Mr. Jaitley, who also serves as Defence Minister, has been hearing from bureaucrats at the Finance Ministry that the money simply cannot be found for the increase without politically controversial subsidy cuts. The Rs. 2,24,000-crore interim budget for 2013-14 presented by the outgoing government envisaged an outlay of 1.74 per cent of the anticipated GDP for defence, an historical low. The service chiefs are concerned that a lower allocation will choke modernisation plans that defence experts believe are necessary given growing Chinese military power, the sources said. Finance Ministry officials say restructuring subsidies could make funds available, but add that such measures are unlikely to be in place before the Budget is presented in July. 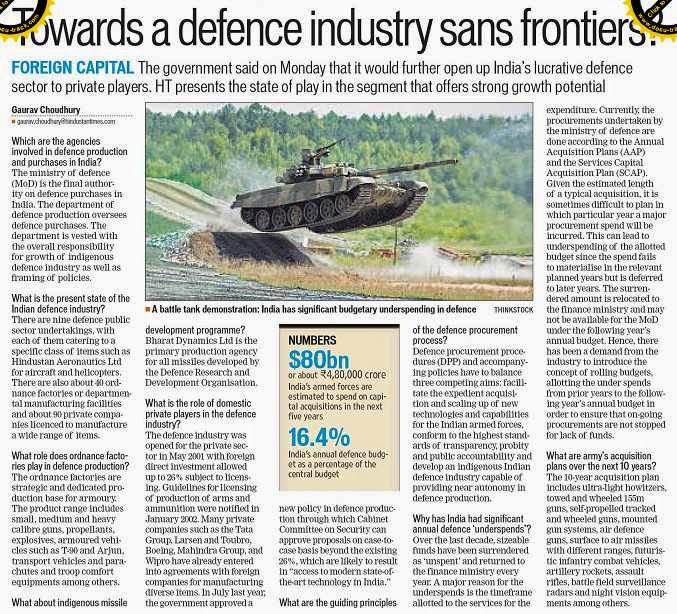 Industry spokespersons, though, have suggested that insolvent public sector units can be stripped to finance defence acquisitions. In a meeting with Mr. Jaitley on Friday, Confederation of Indian Industry president Ajay Sriram suggested the government monetise the assets owned by 67 public sector units that had gone insolvent. Procurements already committed to account for 90 per cent of the Rs. 89,587.95 crore earmarked for defence capital expenditure in the interim Budget, which, in turn, accounts for just 39.99 per cent of the overall defence budget, with the rest going on expenditure such as salaries and pensions. The Army hopes to make rapid progress on a $647-million deal for 145 M777 howitzers and finalise the purchase of 197 helicopters for an estimated $550 million. The Air Force, in turn, needs $1.2 billion for 22 AH-64 Apache Longbow attack helicopters, $1.4 billion for 15 CH-47F heavy-lift helicopters and $1 billion for six Airbus A330, in addition to $20 billion for 126 French-made Rafale combat jets. In many cases, delays have led to sharp price escalation. Last year, weapons manufacturer BAE Systems shut down the production line for the M777 howitzer the Indian Army had picked as its front-line artillery weapon, potentially adding thousands of crores to their final cost. NEW DELHI: Amid growing speculation that CBI may close its probe into allegations of bribery offer to former Army chief General V K Singh, the agency recently asked the newly-appointed minister to join investigations as it wanted some clarifications. The first-time MP and minister of state wrote to CBI's that "he won't be able to join investigations right now" as he was busy with the Parliament session. Agency officials said they wanted some clarifications from the former Army chief on his allegations against Lt Gen (Retd) Tejinder Singh and evidence provided by him. The audio recording CD, notes from personal diary and RD (record of discussion) of ministry of defence are being examined by CBI and it is planning to soon finalize the investigations. A request to V K Singh to join investigations was reportedly made by CBI during the Lok Sabha elections to which he replied recently. V K Singh's lawyer Vishwajeet Singh, when contacted, told TOI, "CBI has been informed that our client will join later since Parliament session is going on." CBI, however, is not very happy with V K Singh's reply as its investigations are pending. The case has been dragging for more than two years now. Earlier, CBI officials had claimed that there is not enough prosecutable evidence in the case and it might be closed as well. It recently decided to conduct fresh forensic analysis on the audio CD provided by V K Singh as the previous examination did not reveal much. CBI had registered a case on October 19, 2012 after carrying out preliminary enquiry for nearly six months. Tejinder Singh was named by the CBI as an accused under Prevention of Corruption Act, as charges were levelled against him by V K Singh in his complaint. V K Singh had alleged that Lt Gen (retired) Tejinder Singh had offered him Rs 14 crore to clear the tranche of 1676 high mobility Tatra vehicles in the Indian Army. Tejinder Singh had met V K Singh at latter's office on September 22, 2010. Tejinder had denied all charges levelled against him and also filed a defamation case against the former chief.